Bits n Bobs: Sunday 5th July - Bye Dad! After spending time getting the insurance company on to our chipped windscreen, we went into town to get Scott's ski boots molded to his foot & to get the ski binding adjusted. That took quite some time so we quickly had a DaVinci's pizza before taking Scott to the Wanaka airport. It is a wonderfully small airport & really only small planes normally fly in to this airport except for when the airshow is on at Easter time. We checked Scott in and then went to the cafe that has a wonderful view of the runway to have a coffee. Not that there was much in the way of air movements to watch. Towards 3pm a little plane circled around the airport & landed. 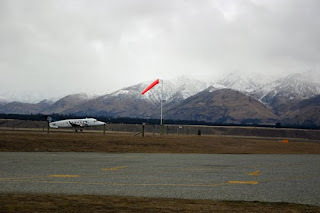 It was the Air NZ plane that Scott was due to fly out on. We walked back to the terminal. Honestly terminal is a very grand term for this little prefabricated unit. It is a one man band kind of place. The same man that checked Scott in went to grab the luggage trolley & drive it to the plane & unload all the luggage & then he just drove it to the side of the building & told people to pick up their luggage. The same man then took the outgoing baggage out to the pilot who loaded it into his plane. Then the man came back & announced (not over a speaker system it wasn't needed in this small area) that it was time to board the plane. Scott then walked out to the plane & climbed up the steps to get into the plane. Once everyone was on the plane the "terminal man" then went out to the plane & put the airmuffs on & asked the pilot to turn on one engine. Once he was satisfied that it was working alright he asked the pilot to turn the other engine on. Then when that was going to his satisfaction he unhooked the electrical cable that connected the plane to whatever & then he removed the chocks & the plane was away. We saw it take off & then it circled the airport once & it was gone in that low cloud.